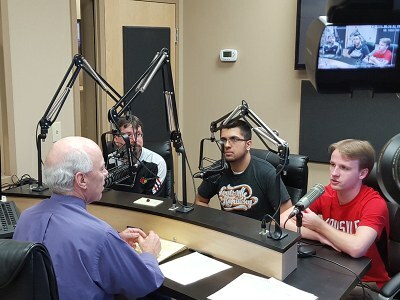 Matt Church (left), Ramapriya Rangaraju (center) and Eric Hahnert (right) being interviewed by Mark Hebert at UofL Today. The U of L Quiz Bowl team competes in various academic competitions throughout the state and country. The format is similar to standard academic team competitions and involves questions covering a range of academic disciplines and subjects. The team competes both in traditional academic competitions and pop culture tournaments, in addition to hosting several high school competitions each year. Please see our Facebook page for further information.